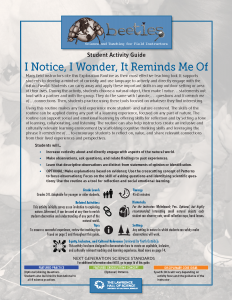 Many field instructors cite this Exploration Routine as their most effective teaching tool. It helps students develop a mindset of curiosity, and provides language tools to actively and directly engage with the natural world. These are important skills students can carry away and apply in any natural setting. Using this routine makes any field experience more student- and nature-centered. After introducing it, instructors can ask students to apply the routine to deepen their understanding of the natural world during any part of a field experience. During the activity, students pick up a natural object, such as a leaf, and make “I notice…” statements out loud with a partner, then share some of their observations with the group. They do the same with “I wonder…” questions, and with “It reminds me of…” connections. Then, students practice using these tools while exploring whatever they find interesting. This simple routine can help students get beyond seeing nature as a “green blur,” and lead them to never be bored in nature again. Increase curiosity for and directly engage with aspects of the natural world. Make observations, ask questions, and relate findings to past experiences. Learn that descriptive observations are distinct from statements of opinion or identification.